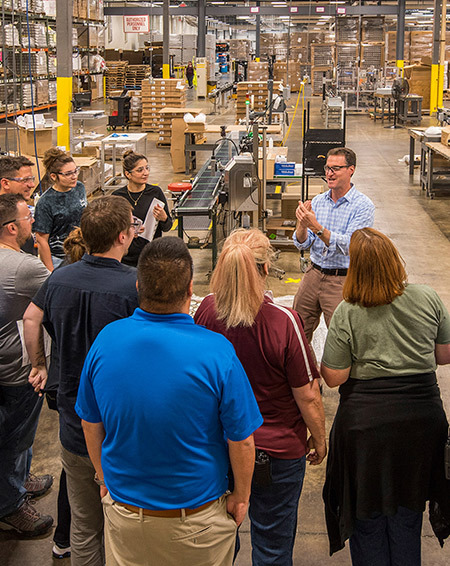 Alene Candles CEO Rod Harl talks to a group of employees on the production floor. He says his companywide introduction of Conscious Leadership techniques has enriched employees’ lives. Rod Harl is CEO of Alene Candles — a company in the news recently with its annual call for seasonal employees to work on ramped-up production for the Christmas season, which accounts for nearly 40 percent of the growing firm’s sales. He and a partner acquired the Milford company in 2008 from Paul and Nancy Alene Amato, who founded the firm in 1995. The firm does contract manufacturing of candle products for retailers and others, including the beauty supply chain Bath & Body Works. Q. You have a technical and software background, so how did you become CEO of a candle company in New Hampshire? A. My business partner and I did start working in the software business, but we parted ways in 2000. In 2006, we reconnected and decided we wanted to work together again. So we spent an entire year looking for companies — I was in Colorado and he was in New York City. We encountered Alene on Memorial Day in 2008 and closed on the company in December. We were very fortunate to find Alene. The company was smaller, and since then we’ve increased by about sixfold the number of products we make each year, and we’ve grown from 75 to almost 400 employees year-round. Part of that growth has been the buildout of the tech side. We now have a dozen scientists — techniques used on the technical side aren’t commonly used our industry. Q. What made Alene attractive to you? A. You mean, was it a lifelong dream of mine to make candles? There were a couple of things that made the company attractive. The most fundamental is that candles are a product that are consumed through usage, so we looked at businesses with an element of renewable demand. There are businesses that sell capital equipment that do great as well, but if you sell a piece of equipment, you lost your customer for eight years, 20 years, or whatever it is. Q. You have become something of an evangelist about Conscious Leadership. What is it? A. It’s a basket of tools that are based on a handful of mindfulness principles. It’s the idea of taking exactly 100 percent responsibility, not more not less, for your role in your work, your home, your life. People get into drama situations when they take on more than 100 percent rather than asking others to accept their own responsibility. But it’s also about giving appreciation and accepting it too. That has more impact on employee satisfaction than spot awards and things like that. Speaking candidly, I was raised where you don’t confront people with difficult issues – you dance around them. What we teach people is it’s OK to be candid, but lead with your heart. The point is always taken well and the impact for us is that the air of conflict or tension or likelihood that people are going to react poorly – that whole temperature just drops. No one’s forcing a bad interpretation or reaction from them. The way you react is completely under my control or ownership. We’re teaching people throughout the organization to see it that way, and they’re much more thoughtful in their conversations and how they interact. A. As a mainstream manufacturer, we employ a bunch of people who clock in and out, and what we’ve found is that these conscious leadership tools and principles resonate even more in our case than if we were employing all professionals making healthy salaries. Q. What was the rollout like? A. We started this in 2016 at the leadership team level – at the time, there were 12 to 15 of us. I wanted to do a trial balloon to see if I could get buy-in across the top. Then I met with one of founders of the Conscious Leadership Group, which is based in California. I asked, “What have you done at the hourly level, the factory situation?” They had worked with manufacturing companies before, but they hadn’t gone below the salary ranks. We said, “Let’s give it a shot.” At first, expectations were pretty low. We tried a mix of volunteering and prodding to get people to take part. But the hourly folks, while they may have been skeptical initially, once you punch through that initial barrier, they were extremely receptive and embraced the ideas because they had never been jaded by the management tool of the month or the job they had in 2002 and they brought in outside consulting trying to espouse teamwork — they were talking to people who were really trying to educate them about using it. Q. What has the result been? A. I’m very passionate about this, because these folks have very complicated lives to degrees that we don’t understand or don’t experience often. What we’re able to do is give them some skills to help them manage their own lives that cause shifts that are mind-blowing. For example, for someone who has a tremendous amount of drama and complexity in their lives this helps reduce the drama, and they’re happier. This is a way to help them enrich their lives. Emotionally healthy people are more productive employees, turnover goes down and feels good to a manager to hear these stories.